Suggested by Sonic Fang Slade Terrestrial XIII is a strong dragon and definitely one that Gao will have to be careful against. 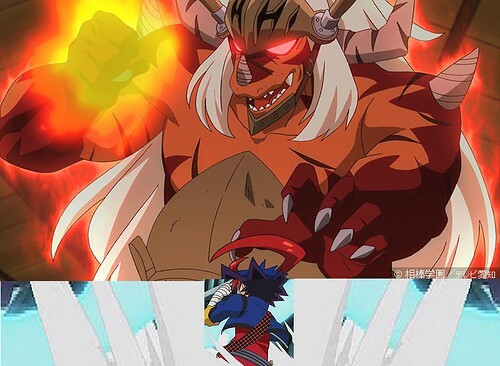 Still, Gao does have Drum Bunker Dragon by his side who ended up surpassing his father by the end. Gao also has the Dragon Force at his disposal which allows him to fly and greatly increases his physical abilities. Fang will be attacked from all sides and simply won’t be able to compete with that much destructive power. Gao Mikado wins. This entry was posted in Battles, Fang Slade Terrestrial XIII Battles, Gao Mikado Battles and tagged Fang Slade Terrestrial XIII, Gao Mikado by dreager1. Bookmark the permalink.